We offer custom full stack software development and maintenance for government and private sector clients. With our experienced management and young, enthusiastic development team, we speed up your projects and optimize costs without compromising quality. We work with modern programming languages and frameworks, as well as legacy code, to provide the entire range of solutions from problem definition to user experience, and from data modeling through scalable middleware to front end development. We are a Woman Business Enterprise (WBE), certified by New York State. We have extensive experience with both SQL and NoSQL databases. We know relational models, how to optimize them, and how much to normalize them, but we also understand the benefits of non-relational data stores. 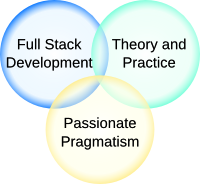 The heart of the stack contains the value an application provides through its business logic. We are fluent in multiple languages, frameworks, and programming paradigms, and we have mastered the art of scalability. We are experts at both designing and implementing interfaces that reduce users' cognitive load and optimize their processes. Whether it is on the web, a phone app, or a desktop client, we have the expertise to create it. Need more information? Take a look at our credentials or management.